If you’ve been struggling with a squeezed tone when you sing and you’re unable to figure out how to step out of that, rest assured it isn’t at all difficult to knock that out as you might think. In this article I will explain one of the easiest ways to help you hold it in without recruiting your outer larynx muscles into sound production. Let’s say you’re using one of my prerecorded scales and you have a particular problem with producing MUM the higher you go without recruiting. Here’s how to get around that. Hum your scale on your way up and then switch to a MUM (pronounced with more of a dumb sound MOM) on your way down. And you can do the same with a Lip Roll up and a MUM on the way down; or Lip Roll on the way up and the vowel ‘I’ or EEEE on the way down by simply parting your lips to produce ‘I’. Don’t try to manipulate anything. Only part your lips and it’ll happen naturally. This should solve the problem quite easily, providing you stay focused and you breathe properly. If you like this article, please feel free to share on your social media using the links below. 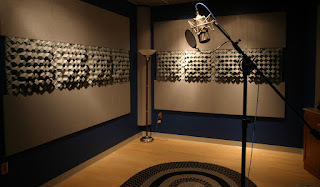 Since a lot has happened in recent months, what with the publication of my new book and the release of my new voice training audio product to go with it, not to mention, a lot of restructuring in my studio programs as well, I feel the time has come for me to overhaul my entire ‘in-studio’ voice training programs. You may still view the old system here. However, I won’t be taking the old programs offline because the page has been there a while and is still pulling in considerable traffic. And what’s more, there are programs in the previous schedule that I intend to keep running. My newly created modules, however, are mainly for my long-term clientele. And you’ll see that it makes perfect sense. My new voice training programs, tailored to your individual needs, are going to be divided up into four parts and here’s how it works. Before you begin private voice training with me, you are invited to come in for a free half-hour voice assessment session. I will listen to you sing a couple of lines; run you through a breathing exercise; and then put your voice through the scales on the piano and I’ll give you my professional feedback. It’s that simple. And then I'll allocate training slots that are most convenient for you. This involves private tuition inside my studio. (You’ll find information on my Skype training here). A program comprises a total of 10 hours broken up into one hour per session. In other words, every private session with me runs for one full hour. My studio is open Monday, Tuesday, Wednesday and Saturday from 11am till 8.30pm. In this program you’ll get an introduction to speech level singing technique with intensive vocal drill workouts on piano to help rebalance your voice, extend your range AND mend the bridges. In Level 2 we shall continue with the vocal drills on piano for another 10-hour set, but I will be throwing into this program some truly amazing Funky n' Fun Vocal Workouts Parts 1 & 2 to help you develop your musicality. In Level 3 we shall continue with the vocal drills on piano for another 10-hour set, but I will be throwing into this program more advanced Funky n' Fun Vocal Workouts, again, to further develop your sense of music and to introduce you to some of the main musical vocabulary all musicians should know. In Level 4 we shall continue with the vocal drills on piano for another 10-hour set, but I will be alternating this with a more jazz, blues, pop R&B vocal workout schedule to help you develop your own unique style. Please note that Level 4 is also the beginning of your maintenance program. Which means from this point on, you may continue to buy your ten-set programs (optional) in order to maintain your voice and to continue to grow your talent. During your in-studio voice training sessions, at times, I will record segments of your training as you vocalize to the scales on piano. The tapes will then land in your Inbox and you can use them to practice at home. To get an idea, you can listen to one of my pupils in session in the video below. Furthermore, you may also purchase online, some more extended vocal workouts here. 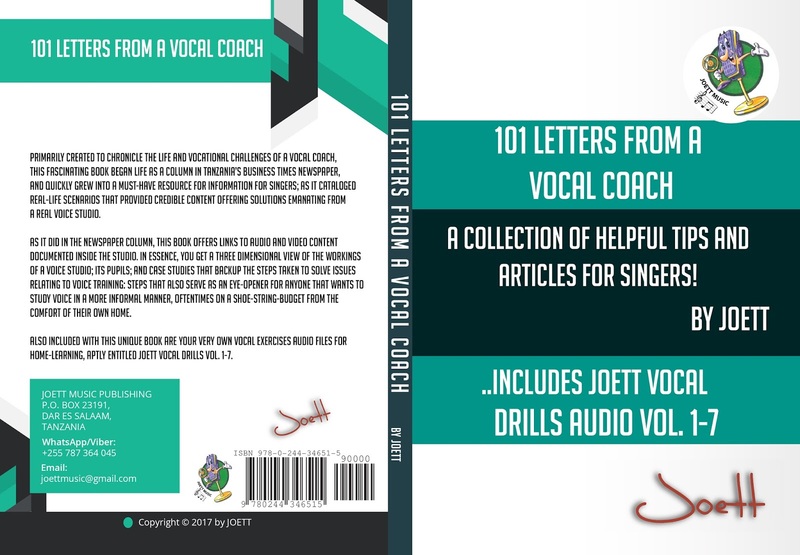 And when you purchase my new book 101 Letters from a Vocal Coach, you’ll also receive the English version to my audio product Joett Vocal Drills Vol. 1-7 (includes Breathing Exercise). You can purchase my book in paperback from Amazon, Barnes & Noble and Lulu. If you live in Tanzania and you wanted to buy my new book 101 Letters from a Vocal Coach but making payment online was a problem, Easy Buy Africa located in Dar es salaam's Oysterbay is a dead-ringer for local payment solution I’m sure you’re going to like. You'll be delighted that there’s absolutely no need for a credit card, PayPal—not even a bank account. Click here. I have some pretty good news for you today. 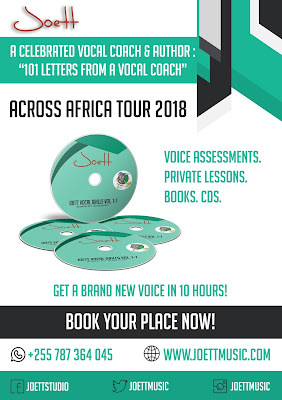 If you live in Tanzania and you wanted to buy my new book 101 Letters from a Vocal Coach but making payment online was a problem, I’ve found a dead-ringer for local payment solution I’m sure you’re going to like. I have just discovered a shop in Oysterbay, located at the petrol station on Haile Selasie Road right next to Pizza Hut. The shop is called Easy Buy Africa and you’ll be amazed how easy it is to buy stuff online. To purchase my new book, simply enter the URL to my book's sales page from Amazon, Barnes & Noble or Lulu at EasyBuyAfrica.com. (Please note, there's a 25% discount on Lulu). You'll then be able to make payment in local currency, details of which you'll find as you go through the payment process. If you have any questions, however, please get in touch with Easy Buy Africa directly. You'll find their contact information on their website. Or, you can walk into their shop in Oysterbay for a coffee if you like and they'll talk you through the ordering process. The staff there are very helpful. Using this platform you are not limited to any single Retailer or Marketplace offering. With EasyBuyAfrica you can buy anything you want from around the world, whether it’s a product; a book; online bids for your favorite team signed t-shirt; an app; or even pay your university fees. No need to worry about having a credit card, PayPal or even a bank account. You can pay cash using your local currency. In Conclusion: I hope this helps. If you know of anyone that may want to purchase my book in local currency, please do me a HUGE favor and Share this blog post with others by clicking the Social Links below.